When designing the plan for your custom pole building in Ohio, you want to make sure it is has everything you need, is built to your standards, and includes beautiful features… but without breaking your bank. 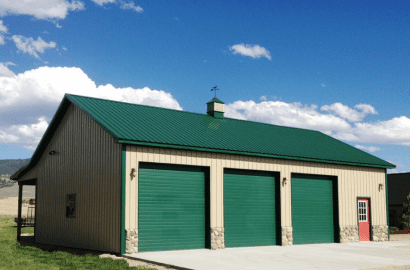 While custom pole barns in Ohio are a relatively inexpensive building option, you still want to make sure you don’t end up in a huge financial pickle. Here are eight simple money-saving tricks to consider when discussing your design plan with custom post frame builders in Ohio. 1. Research your options on contractors and ask the right questions. Amish barn builders in Ohio who have a background in pole buildings are highly skilled professionals who will provide quality customer service and ensure you are making the best decisions for your building. 2. Wider spaced columns will allow you to save both time and money on labor. The spacing of columns is generally between 6 to 10 feet. With a careful design to reduce the number of columns and trusses needed, you’ll reduce your bill by a good amount. 3. Adding wainscot to the lower section of the exterior will protect your building from any abuse and dents it may receive from large equipment. Replacing a section of wainscot is much cheaper and easier than replacing the entire wall. 4. Sliding doors instead of overhead garage doors are generally a less expensive door option. For agricultural farm buildings in Ohio, sliding doors are a great option, as they are easy to use and can open as far as you need. This, in turn, helps retain heat. 5. Choose add-ons wisely. It’s not wrong to want your building looking attractive on the inside and out; however, choosing too many add-ons can quickly raise your bill. From cupolas to overhangs, research your options and carefully select what add-ons will benefit you and your building the most. 6. Choosing durable materials will allow you to save money in the long run. While there may be cheaper options available for siding and doors, you can save money up front by investing in the more durable materials that are a tad more expensive. As a result, you’ll spend less on repairs in the future. 7. Control condensation before it begins by either installing a commercial membrane or purchasing DripStop. Both will protect against and control condensation in your building, if it is not insulated. This can save you thousands of dollars rather than investing in ceiling insulation. 8. Appropriate insulation is critical in saving money on your pole barn. There are many insulation material options to choose from, so carefully consider which one will be best for your pole building in Ohio. For example, a steel liner system is much cheaper than drywall and is easier to install. When discussing with custom post frame builders in Ohio, communicate your budget with your contractor so they can help ensure you’re receiving the most bang for your buck. This entry was posted	on Monday, April 15th, 2019 at 7:49 pm	and is filed under Uncategorized. You can follow any responses to this entry through the RSS 2.0 feed. Both comments and pings are currently closed.